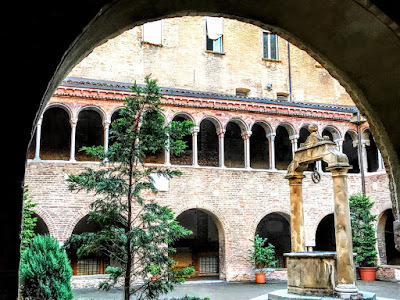 There is a little Zion in a quiet piazza in the heart of Bologna. For more than 1,000 years, the Basilica of San Stefano (Basilica di Santo Stefano) has been known as the Sancta Jerusalem Boloniensis, or Bologna’s Holy Jerusalem. San Stefano is not just one church or basilica, but a complex of church buildings known locally as Sette Chiese (‘Seven Churches’) and also as Santa Gerusalemme (‘Holy Jerusalem’). 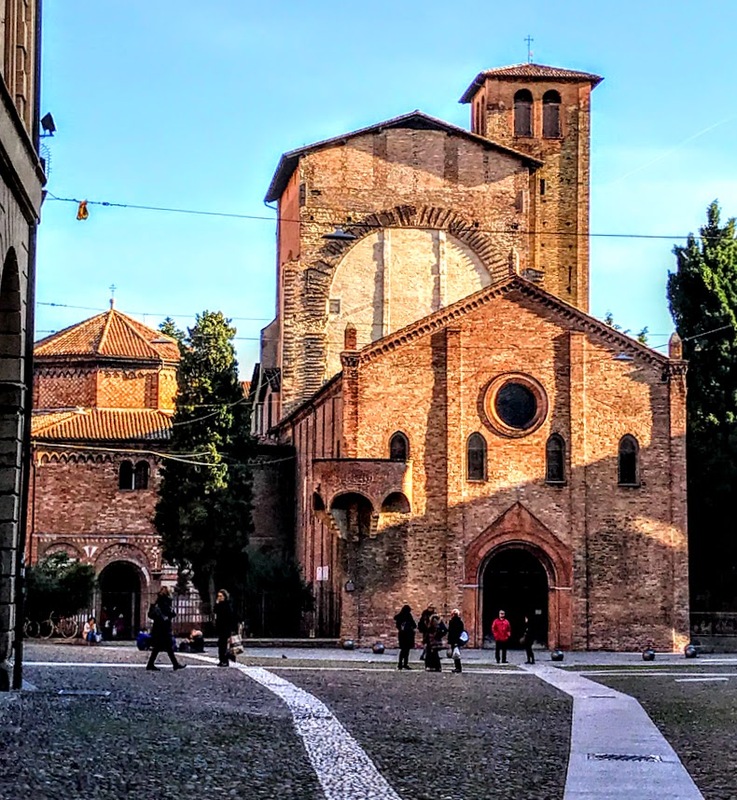 Santo Stefano faces onto Piazza Santo Stefano, a long isosceles triangle rather than a square, and one of the most beautiful of Bologna’s many piazze. San Stefano and its precincts stand at the far end of this piazza, at the shortest edge of the triangle. 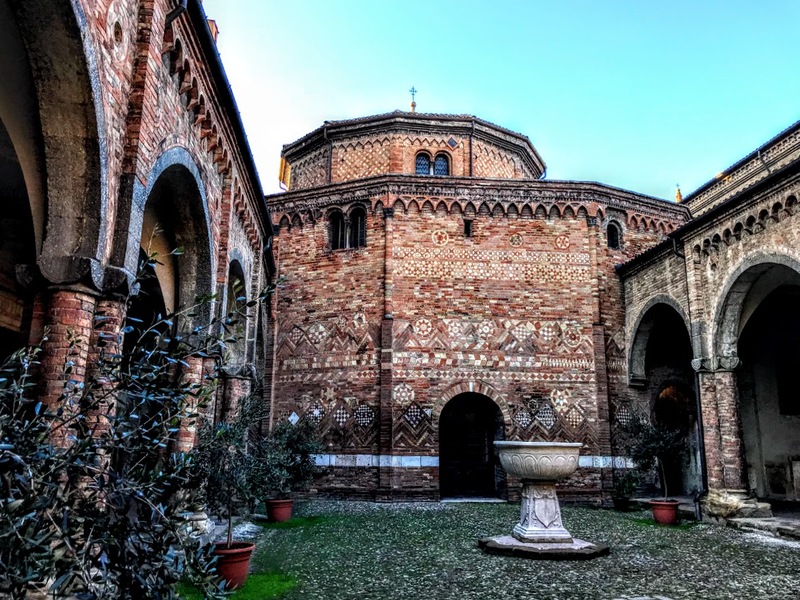 The architectural ensemble of San Stefano is sometimes called le Sette Chiese or the Seven Churches. 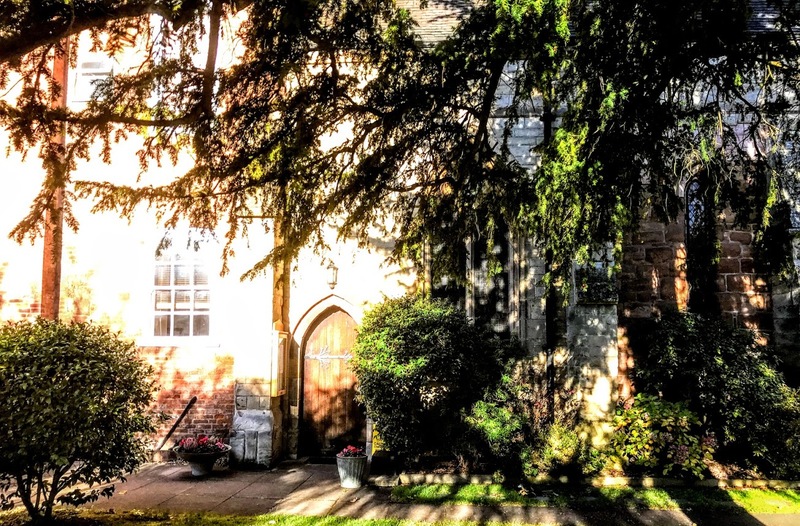 The number seven has a mystical significance, but in fact there are now four churches, fused together in this complex maze or ecclesiastical labyrinth. 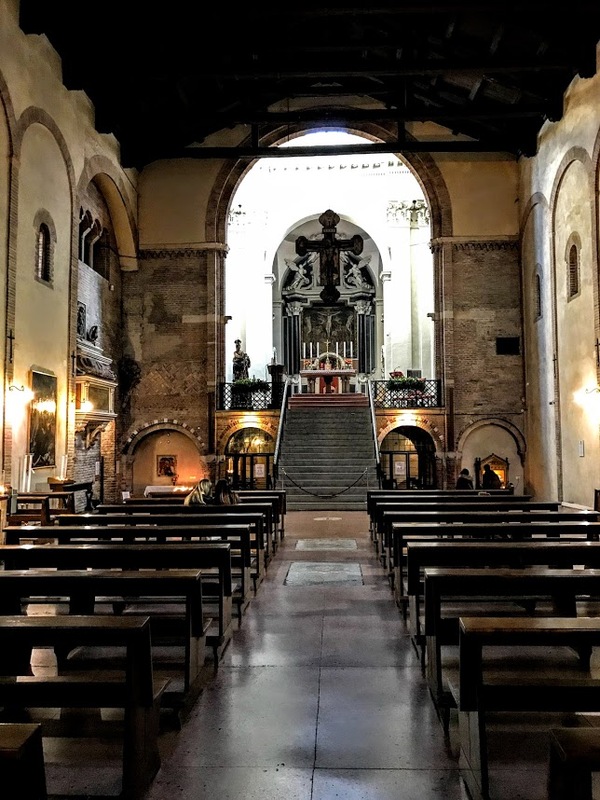 The entrance to Santo Stefano is through the largest and most prominent building, the Church of the Crucifix, an austere space dedicated to the Passion of Christ. This is the Church of Saint Stephen or of the Holy Crucifix, built in the eighth century and reshaped in the 17th century, with a crypt. The altar stands on a mezzanine at the top of a double flight of stairs. Suspended above is a Byzantine-style crucifix, with a grey and skeletal Christ close to death. He is watched by his mother, the Virgin Mary, and Saint John the Evangelist. This is the work of the artist who became known as Simone de’ Crocifissi, or Simon of the Crucifixions. A similar crucifix, but Baroque in style, hangs at a distance behind the first crucifix, in the apse of the church. These two works are separated by about 10 metres and 200 years. The Abbot Martino was buried in the crypt below in 1019. A low door on the left leads into the second church in the complex, the Holy Sepulchre. This tall, cylindrical building stands on the site of a Roman temple of Isis, the first sacred building on the site. According to tradition, Saint Petronio built the basilica over the temple of the goddess Isis, replacing it with a building that recalled the Church of the Holy Sepulchre in Jerusalem, although the building seen today is more likely to have been modelled on the later Crusader Church than the earlier Constantinian church. One of the Roman columns still stands, a slim marble rod jammed up against a stouter brick-built neighbour. In the middle stands a 1,000-year-old mausoleum – a building within a building. It was planned as a replica of the tomb of Christ in the Church of the Holy Sepulchre in Jerusalem, but has been altered and amended down the centuries. 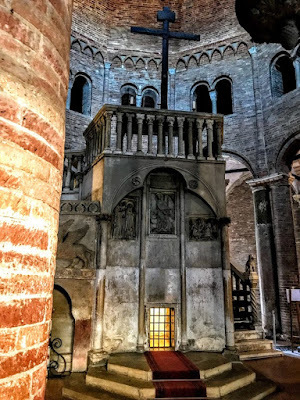 This was the burial-place of Saint Petronio, the fifth century Bishop of Bologna and patron of the city. At the bottom of the structure, like a grate in a fireplace, is a barred window, through which the grave of Saint Petronio could be seen. His body was moved in 2000 to the Basilica of Saint Petronio in Bologna’s Piazza Maggiore, where his head was already enshrined. The decorative work includes winged griffins, stylised lions, and three dozing soldiers who slept through the Resurrection. 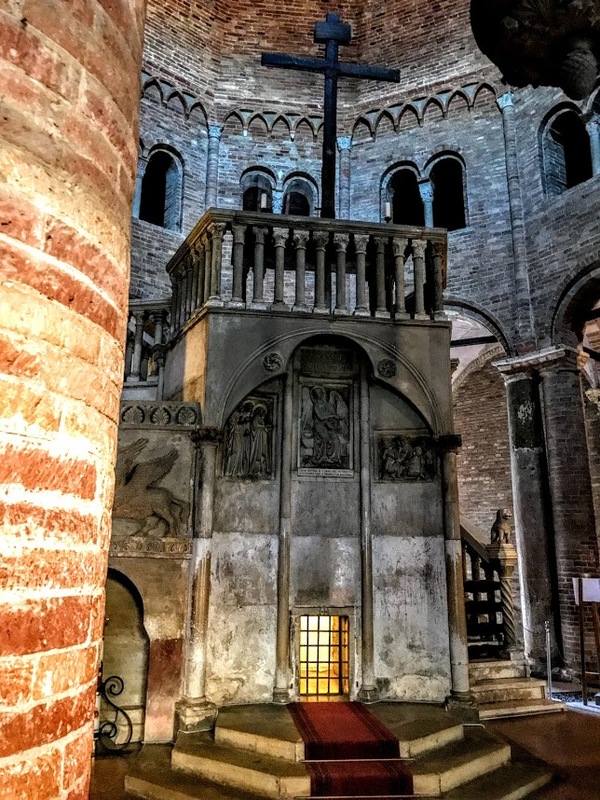 The Sepulchre leads to the next building, the Basilica of Saint Vitale and Saint Agricola, built in the fourth century, and rebuilt in the 12th century. 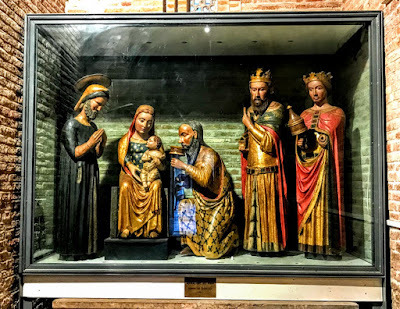 These two Romans, master and servant, were the first citizens of Bologna to become Christian martyrs when they were killed in the year 305 during the persecutions of the Emperor Diocletian. Their bodies were unearthed in 392 and reburied by Saint Ambrose of Milan. The church is bare but has some warm decorative touches, such as the low-relief peacocks and deer on the stone sarcophagus the saints. Outside the Holy Sepulchre, the Courtyard of Pilate (Santo Giardino, the Holy Garden), dates from the 13th century and recalls the Roman paving in Jerusalem where Christ was condemned at his Passion. In the centre, a marble basin known as the Catino di Pilato is a Lombard work from 737-744, recalling how Pilate washed his hands of any responsibility of what happened to Christ. The marble basin was the gift of the Lombard kings, Liutprando and Ilprando, who regarded Saint Stefano as their main religious centre. Under the portico at the centre of a window on a column, a 14th-century sculpted rooster, known as the Rooster of Saint Peter, recalls the biblical story of Saint Peter’s denial. The Benedictine cloisters, dating from 10th-13th century, are particularly appealing for the double open gallery, one of the most splendid works of architecture in the Romanesque style in this region of Italy. The capitals of some of the columns take the form of unhappy, naked little men, hunched or crouching or, in one case, clinging to the top of the column like a monkey on a palm trunk. These naked homunculi are the work of the Lombards, who are also responsible for the magnificent brickwork patterns, like a patchwork quilt in shades of terracotta, that make up the walls of Pilate’s Courtyard. 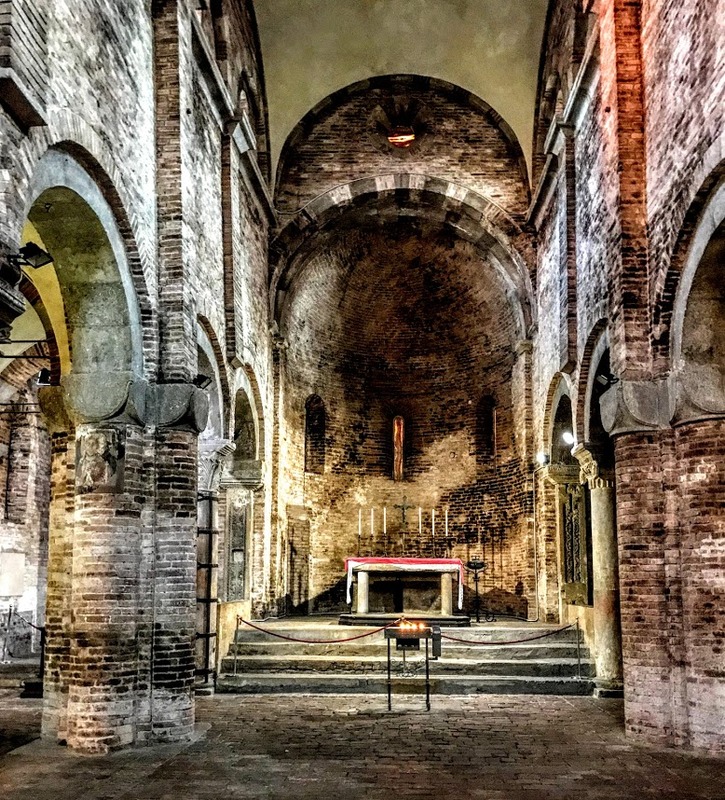 The fourth church, the Church of the Holy Cross or the Martyrium, is also known as the Church of the Trinity and dates from the 13th century. Its width is greater than its length, and it features a series of niches along the back wall. 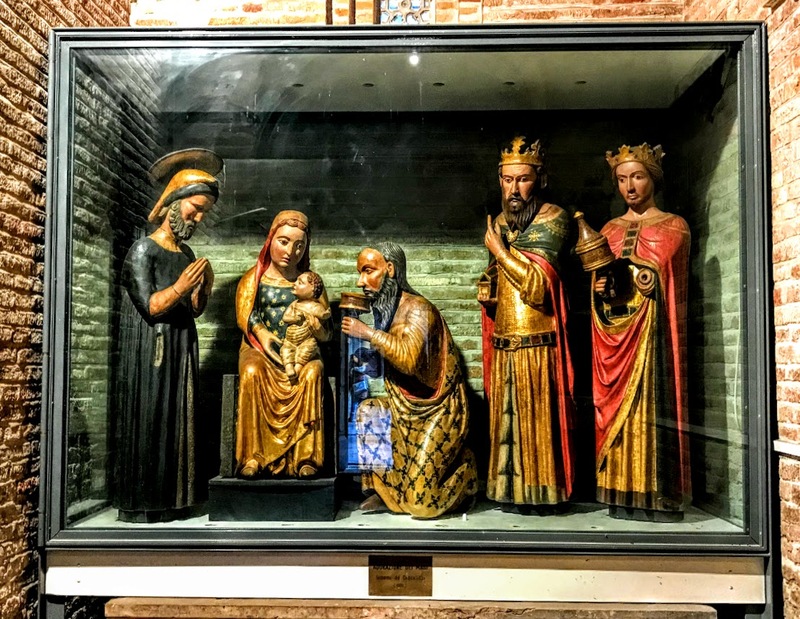 One niche contains a colourful and joyful group of wooden figures representing the three kings presenting their gifts to the Christ Child. These too are the work of Simone de’ Crocifissi. A horizontal wooden statue depicts the dead Christ, his feet foremost, his pierced hands crossed over his abdomen, his head lost in shadow. 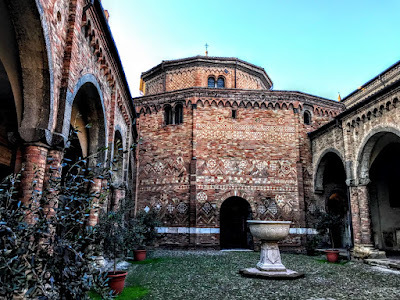 In addition, this complex includes the Chapel of the Bandage (Cappella della Benda), dedicated to the strip of cloth worn around the head by the Virgin Mary as a sign of mourning, and a museum. This Jerusalem of Bologna has evolved over the centuries to present a symbolic pilgrimage. 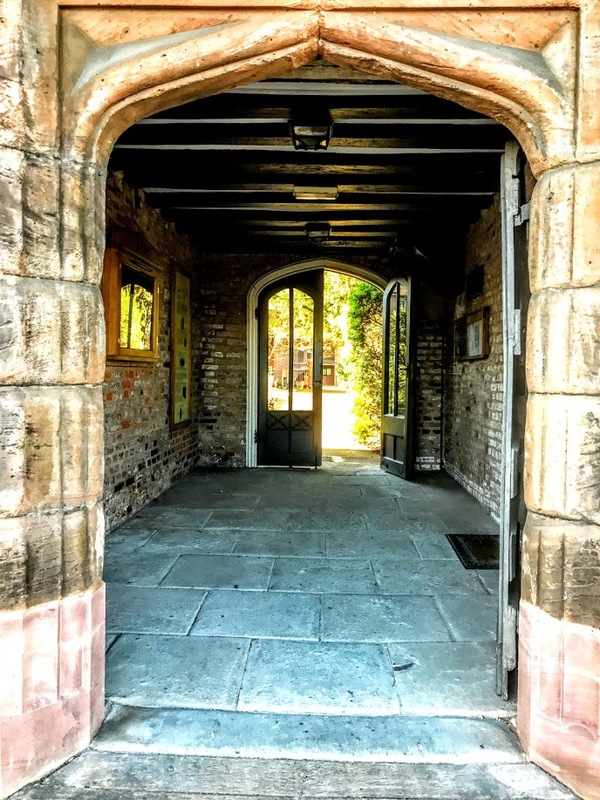 On each visit to Lichfield, I return to the chapel of Saint John’s Hospital, to take some quiet time to pray, to think, and to say thank you for the unconditional, over-flowing love of God that I have known ever since I first visited this chapel almost half a century ago in 1971. Friday morning was a clean, crisp winter’s day, with clear blue skies and – despite the cold temperatures – strong, bright sunshine. Between breakfast in St Johns House and catching a mid-morning train to Birmingham, I stopped into the chapel in Saint John’s. The place was busy, with two people checking the fire extinguishers, and two others busy cleaning the chapel with dusters and a vacuum cleaner. But f we cannot find our own quiet moments with God in the middle of an ordinary busy working with God, we are not going to find those times anywhere else. I sat and prayed, finding my own place of prayer and peace as others worked around me. It was proving to be a very demanding working week, and there was still more ahead, including a lengthy journey back to Askeaton later that evening. I needed this time in this sacred place, even for a few, short minutes. The next few weeks promise to be even busier as we move into Advent and preparations for Christmas. We all need to know where we can find these spiritual oases as we journey through life. From Saint John’s, I walked back along Saint John Street and Bird Street to Minster Pool and Lichfield Cathedral – the same route I had walked many decades ago on that memorable Thursday afternoon, and found myself thinking again about where, as a teenager, I had listened to the first promptings of ordained ministry had been heard. On my back to St Johns House and Lichfield City Station, I stopped to photograph some shops with curious gables on the corner of Wade Street and Saint John Street. These two shops were probably in the early 18th century. They are built of brick, partly roughcast, and with tile roofs. 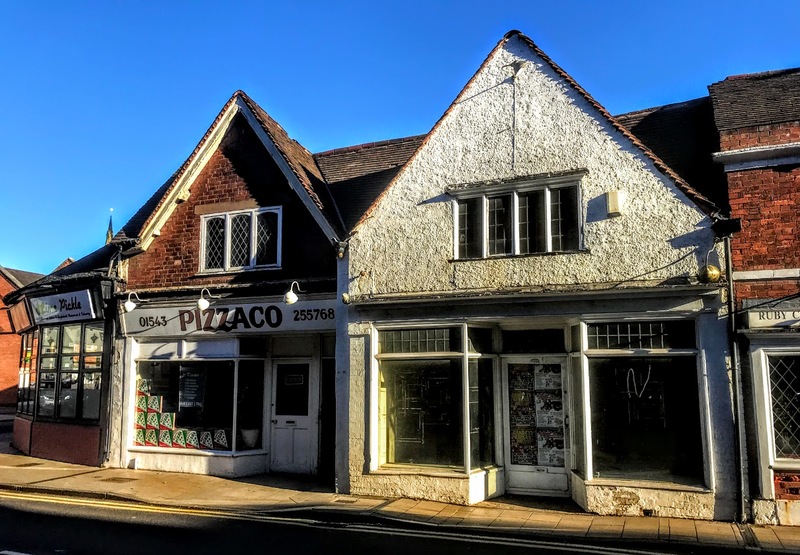 They are single-storey buildings with attics and two gables to the front facing onto Saint John Street. 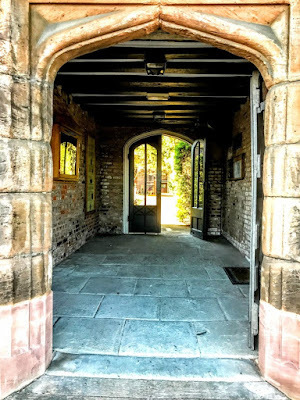 This was one of my shortest return journeys to Lichfield in recent years, with no time for rummaging in the bookshops or relaxing in the coffee shops. 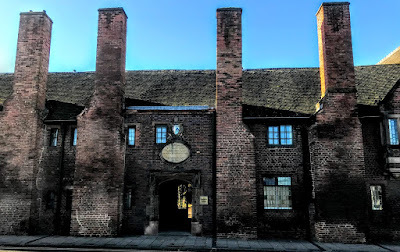 But even a short walk like that on Friday morning was a reminder that there is more of architectural interest that I need to photograph in Lichfield. I caught the weekend edition of the Lichfield Mercury before catching the train at Lichfield City Station, and once again took a deep breath as a I passed the memorial plaque at the end of the steps remembering Private WR Jones who 19 when he was murdered by the IRA on the platform in 1990. But, who knows, I may be back sooner.